What is a pleural effusion? Pleural effusion refers to an accumulation of fluid within the pleural cavity. This fluid is usually located within the pleural sac which is a serous membrane covering the lungs. The pleural sac can be thought of as a "plastic wrap" around the lungs that can potentially hold fluid or air (a potential space). It normally contains only a small amount of fluid, sufficient to keep the lung surfaces slippery and prevent them from sticking to the chest wall. "...pleural effusion involves fluid on the outside or surrounding the lungs..."
When excess fluid enters this space, it compresses the lungs so that they cannot fully expand and results in impaired breathing. It must be emphasized that a pleural effusion involves fluid on theoutside or surrounding the lungs, not within the lung tissues. Fluid accumulation within the lungs is generally called pulmonary edema. What are the clinical signs of pleural effusions? "Many cats will present with open-mouth, rapid breathing." Many cats will present with open-mouth, rapid breathing. It is often more difficult for them to breathe in than it is to breathe out. Most cats have "abdominal breathing", where their abdomen is moving in and out in an attempt to maximize the expansion of the lungs. The lung sounds are often decreased or muffled on auscultation of the chest (listening with a stethoscope). When the chest is percussed (tapped with the finger while listened to with a stethoscope), there is dullness (decreased sound) present in the areas of fluid accumulation. What causes a pleural effusion? Hypoalbuminemia (low levels of protein in the blood) secondary to liver kidney or intestinal disease. Chylothorax (accumulation of chyle, a lymphatic fluid that originates in the intestines and has a high concentration of fat). The most commonly diagnosed cause of pleural effusion in cats is chylothorax. 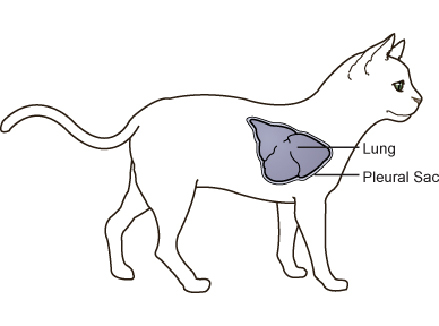 This can be caused by thoracic lymphangiectasia (swollen lymph vessels that leak chyle into the pleural space), congestive heart failure, obstruction of the cranial vena cava (the major vein that returns blood to the heart from the front of the body), cancer, fungal infection, feline heartworm infection, diaphragmatic hernia, lung lobe torsion, or trauma. In many cases, the exact cause of chylothorax remains unknown, and this condition is referred to as idiopathic chylothorax. Diagnosis is based on medical history and clinical signs, the presence of fluid in the chest cavity on thoracocentesis (also known as a chest tap), chest radiographs and chest ultrasound. 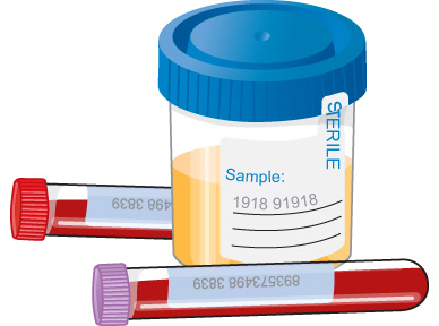 Blood and urine tests are often performed to look for any underlying infectious or systemic disease that is causing the fluid accumulation. The fluid removed from the chest cavity is analyzed for clues as to the origin or cause. What is the treatment for pleural effusion? Pleural effusion is a medical emergency and should be treated aggressively as soon as clinical signs occur. Cats have limited ability to handle any condition that compromises their breathing and often deteriorate or decompensate quickly. The first objective of treatment is removal of the fluid compressing the lungs to allow for more normal lung expansion. This is accomplished by thoracocentesis, which is both a diagnostic procedure and a treatment. The cat often requires oxygen therapy for stabilization prior to performing thoracocentesis. Long-term management is based on the specific cause of the fluid accumulation but includes periodic thoracocentesis, surgery such as thoracic duct ligation, and feeding special low-fat diets or supplements. What is the prognosis for a cat diagnosed with pleural effusion? The prognosis will be based on the specific diagnosis and response to initial treatment. A guarded prognosis is always given when initially confronted with a cat experiencing open-mouth breathing. Most cats with chylothorax have a good but guarded long-term prognosis provided the owner complies with the veterinarian's instructions.